Pupils at Newtownhamilton High School are rewarded for positive behaviour through the allocation of housepoints from teachers. 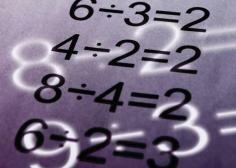 For example, points might be awarded for producing an excellent piece of work or being helpful. 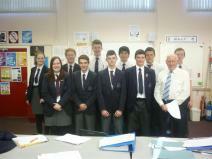 Year 12 Business Studies students recently enjoyed an informative talk from Mr Roy Harpur, owner of Divernagh Dairies. Mr Harpur highlighted the key characteristics of an entrepreneur, the quality assurance and standards required on the farm and the implications of Health and Safety Legislation for both the employer and employee. Pupils were amazed at how much the farmer is responsible for, from the welfare of the animals, the upkeep of the premises, the management and safety of the workers to the financial and bookkeeping work. Knowledge, good organisational skills, time management and hard work of course are all vital to keep the business running successfully. Pupils will now be able to write up their Controlled Assessment Task based on the information they received from this presentation. Once again, local community members came out in force to support Newtownhamilton High at the annual Christmas Fayre on Thursday 21 November. The event, which was run by our energetic School Association, attracted a very large crowd on the evening with £858.60 raised (to date) for school funds. A wide variety of stalls were on display and despite the current challenging economic climate, stall holders reported of healthy profits on the night. Four stalls were also run by our Year 9 Young Enterprise students as part of their preparations for their trip to the 'QuickStart' programme at Rushmere Shopping Centre in February 2014. During the Fayre, recently elected Association Chairman Mr George Blackwood paid tribute to the work of his predecessor Mr Jim Harrison and also thanked School Association members, parents, stall holders and community members for their contributions to a really successful Christmas Fayre. Mr Blackwood concluded by encouraging all parents to continue to support Mr Mullan and his staff by getting involved in future School Association events. 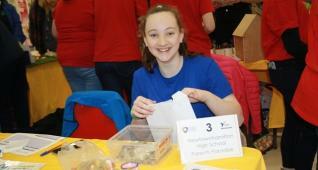 Additonal photographs from the Christmas Fayre can be accessed by clicking here. Principal Mr G Mullan used the evening of the highly successful Prize Night to point out to SELB Chief Executive Mr Gavin Boyd the magnificent quilt that was skillfully made by pupils of Newtownhamilton High and St Paul's High School Bessbrook as part of the Shared Education Programme. 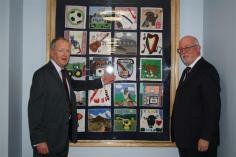 The frame for the quilt was also beautifully created by local craftsman and parent Derek McNiece. These sessions reinforce work that was previously covered during class and also focus on improving examination technique therefore all Year 12 GCSE Maths pupils are advised to attend. 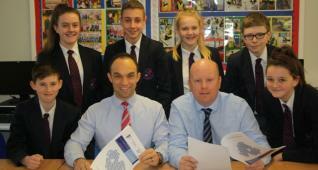 Our Year 9 students are currently competing against each other in the Young Enterprise ‘Quick Start’ programme. They have been working hard since September researching, manufacturing and marketing a product that they can sell to the public. Their first public appearance will be on Thursday 21st November at the School Association Christmas Fayre in the assembly hall from 6pm-9pm. The footballers of Newtownhamilton High recently experienced the highs and lows of football as both the Under 14 and 16 teams travelled to Drumcree College for Mid-Ulster league fixtures on Friday 15 November. The Under 14 team lost out 3-1 with Ethan Whyte scoring (Ethan had won the goal scoring trophy the previous evening at the prize distribution event). Meanwhile, the Under 16 team managed to raise moral with a comprehensive 5-1 win over their Portadown based counterparts. Daryl Johnston scored twice with further goals from Matthew Leyburn, Neil Morton and Josh McCartney. 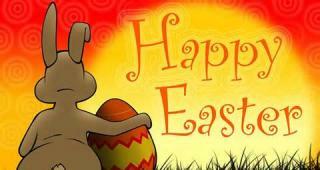 Our School Association Members are currently in the middle of a very busy period. Firstly, Association Members helped to provide sandwiches and tray bakes for the official opening of the new school canteen. Many thanks to all the parents that provided food. 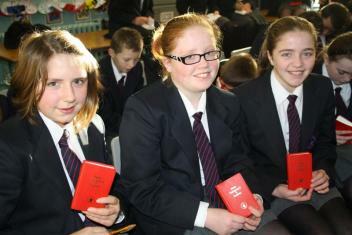 Secondly, a non-uniform day was held on Friday 15 November and this raised £173 for school funds. Thanks to the pupils for their contributions. Thirdly, preparations are well underway for the annual Christmas Fayre that will be held in the assembly hall on Thursday 21 November (6.00-9.00pm). Admission is free and everyone is welcome to attend. 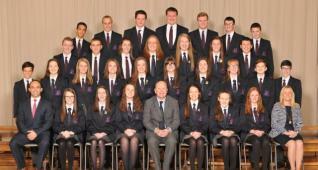 Further information on the work of the School Association can be found by clicking here. 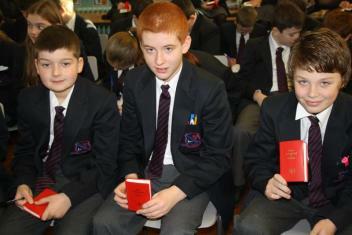 Our Year 8 pupils were presented with New Testament Bibles on Monday 18 November by local men Norman Alexander, Richard Alexander and Timothy Wilson. The 3 gentlemen also spoke to the pupils about their faith and how they distribute Bibles to many organisations in the local and wider community. Our Prize Night celebrations on Thursday 14 November also marked the official opening of the new school canteen. Guest Speaker Mr Gavin Boyd (SELB Chief Executive) officially opened the new state of the art £500,000 facilities by cutting the ribbon. 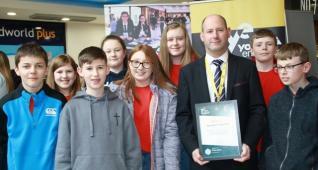 Pictured with Mr Boyd are Principal Mr G Mullan, Canteen staff Mrs S Porter, Mrs C Belshaw and Mrs R Porter, pupils Nicole Bailey and Aaron McKee (Newtownhamilton Primary), Amy McIlveen and Thomas Mitchell (Newtownhamilton High). Thursday 14 November 2013 proved to be memorable night as Newtownhamilton High School opened its doors to the local and wider community to celebrate the success of the class of 2013 and also to officially open the new school canteen. A packed assembly hall was in attendance for guest speaker Mr Gavin Boyd (SELB Chief Executive and Chief Executive Designate of the Education Skills Authority). Mr Boyd also presented certificates and awards to all prize winners with Victoria Gray (pictured top right) winning the Teachers' Cup for Academic Achievement having achieved a very impressive 9 A and 1 B GCSE grades while Steven Geary collected the McNiece Cup for the Best All Round Pupil on the Vocational Enhancement Programme. Congratulations to all our prize winners - well done! A full report on Prize Night can be accessed by clicking here while further photographs are available to view on our gallery. As part of our school's commemoration of the Decade of Anniversaries our Year 10 History pupils had the opportunity to visit the Somme Heritage Centre in Newtownards. The centre examines Ireland's role in the 1st World War with special reference to the cross-community involvement in the 3 local volunteer Divisions: the 10th and 16th (Irish) Divisions and the 36th (Ulster) Division. 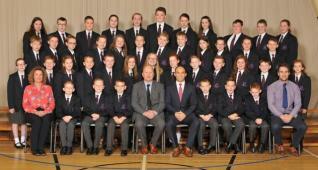 It was a joint venture as we were accompanied by 22 Year 10 pupils from St Paul's High School, Bessbrook. The pupils have been studying World War One in class and were all impressed by their visit which brought their studies to life. They got to handle de-activated weapons that were used by both the German and British soldiers and saw the First World War through the eyes of a soldier that fought in it by walking through the atmospheric trench with the sounds of heavy artillery thundering along the way. 08/11/13 - Soroptimist Public Speaking Competition! Laura Johnston, Elizabeth Blackwood and Caroline McBride participated in the local area competition of the Soroptimist International Annual Youth Award. 1. To encourage girls to play a more prominent part in public life. 2. To improve the art of communication. 3. To encourage girls to develop the skill to speak effectively and to articulate with clarity. 4. To develop self confidence and personality. All pupils received certificates in recognition of their skilled performances. Elizabeth and Caroline were highly commended. This was a huge achievement! Well done girls! 08/11/13 - Pupils Moved By Powerful Production! Pupils from Years 10-12 travelled, with teachers Miss Graham and Mrs Robinson, to The Abbey Grammar School, Newry, to watch their school production of ‘Miss Saigon.’ Miss Saigon is a tragedy of passion and beauty set during the Vietnam War. It is based on Puccini’s opera Madame Butterfly. The production presented an array of inspiring music and lyrics which appealed to all our senses and emotions. The female lead vocalists were outstanding! 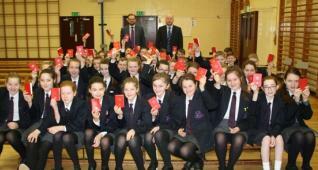 Pupils were enthralled as they watched the love story between the two central characters unfold. Our thanks go to Derek who provided transport and our congratulations are extended to the pupils of The Abbey Grammar School on their fantastic performances! GCSE English Literature pupils recently enjoyed a trip to the Lyric Theatre in Belfast with their teacher Mrs Robinson. They viewed a sparkling new musical adaptation of a novel they study: ‘Pride and Prejudice’. This novel is one of the most popular and enduring love stories of classic fiction. Pupils watched the romance blossom between Elizabeth Bennet and the proud, but dashing, Mr Darcy in this delectable romantic comedy. The acting, musical score, elegant set and costume designs, were fantastic! Our thanks go to Richard for providing transport. 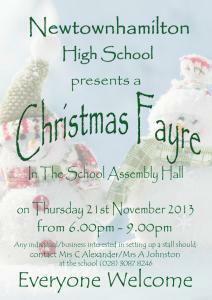 Our School Association will be holding the annual Christmas Fayre in the assembly hall on Thursday 21st November 2013 (6.00-9.00pm). 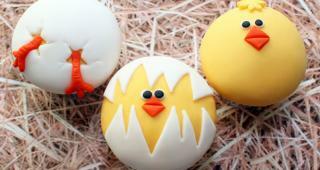 Any individual/business interested in setting up a stall should contact Mrs C Alexander or Mrs A Johnston (02830 878246). A home letter from newly elected Chairperson George Blackwood will be distributed over the coming days and will provide further information on how parents can support this event.